Ireland's ndrew Balbirnie is congratulated by Paul Stirling after catching Rahmat Shah off the bowling of Andy McBrine (centre). Andrew Balbirnie’s second half-century in as many matches helped Ireland level the Gulbahar ODI series 1-1 at Stormont with a three wicket win over Afghanistan on Wednesday. 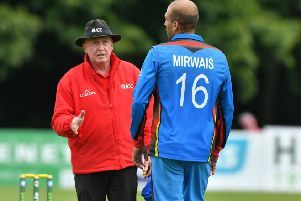 William Porterfield revealed that he would have batted first if he had won the toss, but the captain would have been pleased with how everything turned out when Tim Murtagh struck in the very first over, trapping Mohammad Shahzad LBW for 0. The 37-year-old had collected his best ODI figures of 4-31 in the opening match of the series on Monday and was picking right up from where he left off a couple of days ago as he also removed Hazratullah Zazai and Gulbadin Naib for 7 to leave their visitors reeling on 13-3 in the 5th over. Naib was a prized wicket to collect after his innings of 64 in the opening game was a big reason why Afghanistan ultimately ran out victors. It could have been even better for Ireland when Rahmat Shah pulled Boyd Rankin to Simi Singh at mid-wicket, but the all-rounder couldn’t cling onto the chance. Hasmatullah Shahidi also batted superbly on Monday for his 54, but he wouldn’t be allowed to replicate that after a fantastic piece of fielding from Andrew Balbirnie found the batsman short of his crease and walking back to the tent for 2. Sitting on 16-4 and in serious trouble, Afghanistan desperately needed to form a stand, and captain Asghar Afghan joined Shah to do just that, going past their 50 partnership in the 25th over. The batsmen were looking comfortable and knocking the ball around for singles with ease until Singh got his redemption when he had Shah stumped for 32 after some sharp work from wicketkeeper Niall O’Brien. Ireland’s fielding was much improved in general, and Paul Stirling showed just that with a direct hit to run out Afghan for 39 to leave Afghanistan 100-7. Porterfield’s men would have been looking to rattle through the lower order and dismiss their opposition for 130, but some late hitting from Najibullah Zadran, who ended on 42, helped Afghanistan reach 182-9 from 50 overs. Opener bowler Murtagh returned new career-best ODI figures of 4-30 - one run better than the 4-30 he achieved on Monday. Ireland’s bowling has been at a high standard for the majority of the opening two games, and they would have been the happier team at the interval. That wouldn’t have lasted long after Porterfield was bowled by 17-year-old spinning sensation Mujeeb Ur Rahman for 0, leaving Ireland 0-1 in the first over and getting them off to the worst possible start. Stirling has been in glorious form in white ball cricket for Middlesex in 2018, and he was giving those in attendance a glimpse of that by crunching a couple of delightful boundaries through the covers to help Ireland to 47-1 after the first powerplay. Balbirnie had joined Stirling in the middle, and after his 55 in a losing cause earlier in the week, he was looking in similar touch, and the pair moved onto their 50 partnership in the 11th over. Ireland were setting a fantastic platform from which to see the game home, and it would all depend on what sort of position they were in when Rashid Khan was introduced into the attack. It came earlier than expected in the 16th over, and the 19-year-old looked dangerous from his very first ball. It would be another spinner that made the breakthrough, as Mohammad Nabi, who was playing in his 100th ODI, tempted Stirling down the ground and was stumped for 39. Khan inevitably struck in the 25th over when he trapped Kevin O’Brien LBW for 8 to reduce Ireland to 97-4, and the hosts were in danger of letting a tremendous chance to register a win slip through their hands. Balbirnie was again proving to be the glue that kept the innings together, and reached his second consecutive fifty in the 31st over, where the equation was 58 required from the remaining 19 overs. The Pembroke batsman would fall to Khan for 60, and it was left to Simi Singh, who ended on 36* and batted superbly well under intense pressure, and to see it home with six overs to spare. It leaves Friday’s final match as a winner-takes-all occasion, and Ireland will enter it full of confidence after picking up their first win in all formats since June.